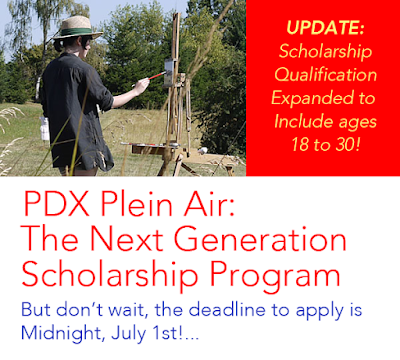 Three outdoor painting scholarships are being offered to young artists in conjunction with Thomas’ 2015 Essential Plein Air Techniques Workshop. Workshop to be held August 14 - 16, 2015 in the Portland, Oregon area. Tuition for this workshop is being funded 100% by a generous anonymous donor. Instruction will be presented outdoors in a small mixed-age group and focus on the technical and artistic requirements needed to paint the landscape en plein air. What will be taught will also apply to any other painting genre and working in the studio as well. Portfolio submissions accepted until Midnight, July 1st, 2015.